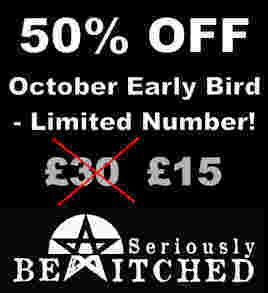 Some of the speakers have just been announced for Seriously Bewitched - the ASSAP symposium at Goldsmith's College, in New Cross, South London, on 28 November. ASSAP stands for the Association for the Scientific Study of Anomalous Phenomena. Previous events have looked at ghosts, demons and vampires, while this one examines the subject of witchcraft, both ancient and modern, from a range of perspectives. Mark Norman is a folklore writer and researcher based in Devon. He will be talking about traditional witchcraft then and now. Dr Helen Cornish is a lecturer at the Goldsmiths anthropology department: She carried out her doctoral fieldwork among British Pagan Witches, studying the politics of historical knowledge. Bekie is a wonderful witch who happens to be a friend of mine. She knows more about witchy spellcraft than pretty much anyone else I can think of. Bekie is also a DJ on Ridge Radio and you can tune in to hear her on Monday early afternoons. Charmaine is a PhD candidate whose thesis examines the effect of Neo-pagan healing spells on health and wellbeing. She will be talking about successful spell design in three (not so) easy steps. Deborah Hyde is editor-in-chief of The Skeptic magazine and a great speaker. Her talk will be on totalitarianism, paranoia, and yearnings for empire and the persecution of witchcraft in the 16th and 17th century. Ethan will offer an overview of the various different new religious movements – from feminist Pagans to atheistic Satanists – to have adopted the term “witchcraft” over the past century, and why they chose to call themselves witches.